Baton Rouge Community College and the BRCC Foundation are presenting a gala event, the Chancellor's Holiday Evening with The TEN Tenors. Created as an entertaining fundraiser, the Chancellor's Evening, promises to provide attendees with a memorable experience watching the art of The Ten Tenors and supporting the Baton Rouge Community College Foundation. The event takes place on Sunday, December 16 at the Magnolia Performing Arts Pavilion on the Mid City Campus of Baton Rouge Community College. There will be a Gala Reception starting at 5 pm, with The TEN Tenors performance beginning at 6:30 pm. “It is an absolute honor to share such an enriching arts event with the Baton Rouge community as an extension of our commitment to serve the Capital Region, and provide an opportunity for patrons to support Louisiana’s future workforce and the advancement of BRCC’s students,” said BRCC Chancellor Larissa Littleton-Steib. 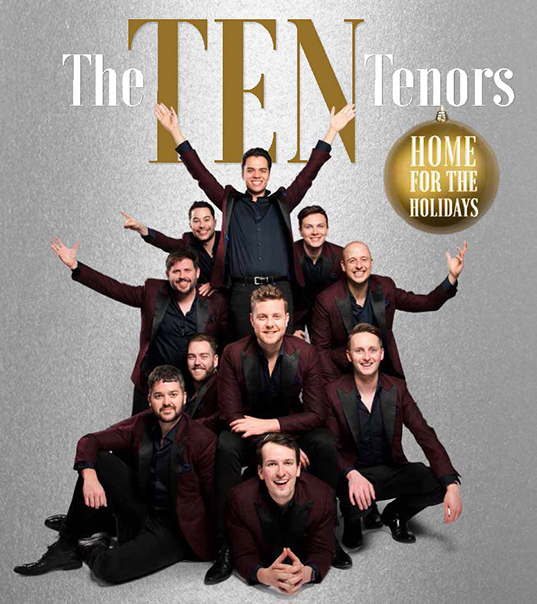 The TEN Tenors are one of Australia’s most successful entertainment groups of all time, with 16 years of sell-out performances across the globe. Celebrated for their colorful repertoire, breathtaking arrangements, and powerful live performances. The TEN Tenors respectfully tip their hats not only to the great classical composers but also to contemporary music’s most famous artists. An evening with The TEN Tenors is guaranteed to surprise and delight in equal measure. Tickets are available at www.brccf.org/tickets.